Harmonix is best known for video games like Guitar Hero, Rock Band, and cluttering up your living room with fake plastic instruments. Its next music game, however, trades guitars and drum sets for collectible cards that has aspiring DJs competing to remix songs—like playing Yu-Gi-Oh in the club. Each DropMix card features an NFC chip inside allowing the game to automatically detect the artist and track. The video game developer teamed up with Hasbro, who gave Gizmodo a demo of the new game, called DropMix, at Toy Fair 2017 a couple of weeks ago. Our biggest takeaway after playing DropMix was that the game feels far more accessible than Harmonix’s previous music titles, since players don’t also need to master a plastic instrument in order to play. Even your video game-challenged parents might enjoy DropMix, which has players strategically playing a random hand of cards that feature various parts of well-known songs by popular artists. The cards, which each have a wireless NFC chip inside, are automatically detected when placed on the DropMix board, which immediately adds the specific part of the corresponding musical track into the overall music mix. Five cards can be in play at any one time, often creating elaborate mixes spanning multiple genres. The first card played during a round defines the mix’s main underlying track, but as additional cards are played, featuring parts of other songs, they’re all perfectly blended into that mix, like a mashup that can be re-assembled in real time. The mixes created by DropMix are surprisingly good, thanks to some clever software, even when songs from wildly different genres are blended together. You wouldn’t think that the Jackson 5, Meghan Trainor, and Skrillex would go together, but the results are always listenable, and we wouldn’t be surprised if people just used DropMix to DJ a party. The game plays out with two teams trying to dominate the DropMix board, and the mix, earning points as they each take rounds. Some of the cards are more powerful than others, letting players trump each other and force their musical tastes on their friends. A winner is declared after a certain level of points are earned, but more interestingly, the game then lets you choose to save the resulting mix to listen to later, if it turned out particularly catchy. The DropMix starter kit includes 60 cards featuring these artists and tracks. 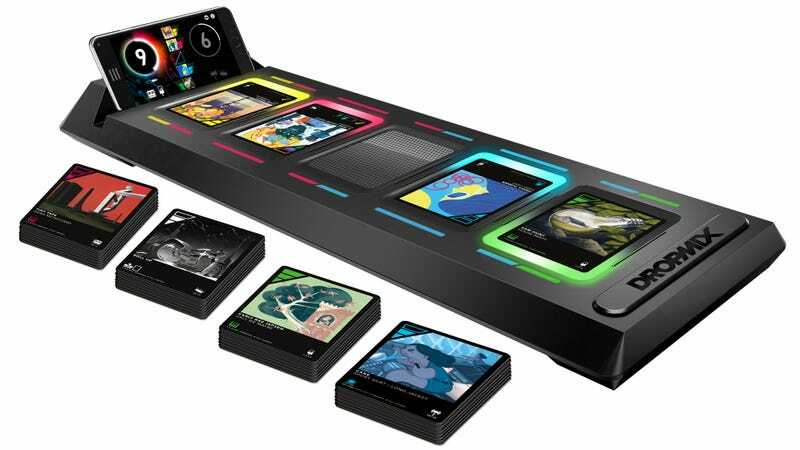 The $100 DropMix starter kit, available sometime in September, later this year, includes the game board and 60 smart cards featuring a decent mix of artists and tracks. However, players will need either an iOS or Android mobile device, and a free accompanying app, in order to play, because DropMix isn’t available for consoles like the PS4 or Xbox One. So you’ll need to factor that into the cost, if you don’t already have a smartphone in your pocket. And if you’re not a big fan of the tunes included in the starter pack, DropMix will be taking further inspiration from collectible card games like Yu-Gi-Oh with expansion packs you can buy. Playlist Packs will expand your repertoire with 16 additional DropMix cards for $15, but there will also be blind bag single cards sold for five bucks a pop if you’re feeling lucky—and want to add a fourth Meghan Trainor duplicate to your collection. Remember When Video Games Came With Fake Plastic Instruments?